UPDATE SEPT. 20: The Las Vegas plumber who saved 3 people is getting his wish. He will be meeting the mayor next week at City Hall. The meeting will take place at 2 p.m. Sept. 25. 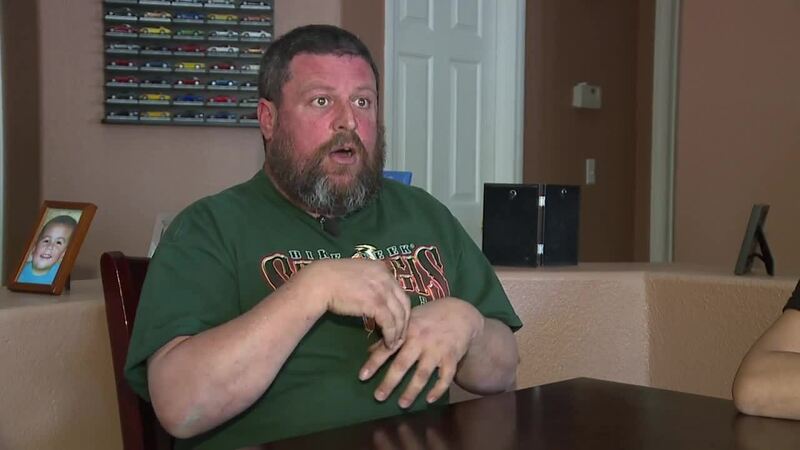 A Las Vegas plumber says his friends joke he should turn in his tools for a superhero cape after he saved 3 lives in less than a year, including two neighbors from a burning home. Brian Kipperman said he just reacted when he walked out of his northwest valley home near U.S. 95 and Ann Road and realized his neighbor's home was on fire. “I just made a beeline, I was like oh my goodness," said Kipperman as he saw the smoke pouring from the home. "I knew the people in there, both of them were older and handicapped,“ explained Kipperman. Kipperman said he didn't have time to put on his shoes as he faced the smoke and flames to find Marilyn Schechtman in her chair and unable to get to her walker or motorized scooter. "He pulled my scooter out of the spot, started it up with the key, helped me get on the scooter and helped me get out of the door," said Schechtman. Kipperman also helped Marilyn's sister Morrisa, who recently had foot surgery, to get out of the home. "I ran into a back bedroom and I grabbed a towel and I just ran them out the door," Kipperman recalled as he saved two of the family's dogs. "I would be very ill, or dead," said Schechtman. Both Schechtman and Kipperman suffered smoke inhalation but escaped the smoke and flames largely unharmed in the fire that broke out July 14. Brian's wife, Adriana, said her husband has a history of good deeds. WATCH the extended interview with Brian in the video player at the top of this page. "Besides being a wonderful husband, he's a wonderful father and just a wonderful friend," said Adriana Kipperman. "He's always willing to help the neighbors, he's always around whether it's plumbing stuff or any little thing is broken, he's always so helpful," added Adriana. Kipperman also found himself in the right place at the right time in 2017, when he spotted a Las Vegas Metropolitan Police Officer who was in a serious struggle with a suspect near Bonanza and 28th Street. "I parked my truck really quick and I jumped out," recalled Kipperman. "I ran over there and I grab this guy's hand and I just clinched it to the fence with all my force and then [the suspect's] other hand comes up with a knife," said Kipperman. 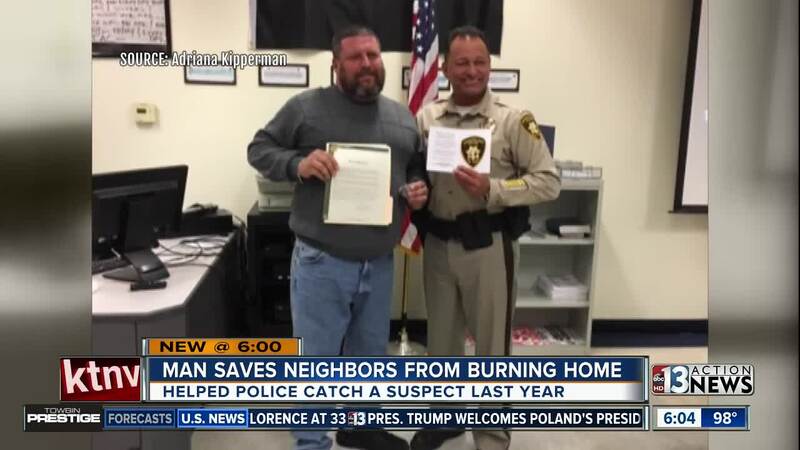 The officer was able to get control of the suspect with Kipperman's help and Las Vegas Police recognized Kipperman for his quick action in a small ceremony during a First Tuesday event at Downtown Area Command in 2017. Kipperman said he was slated to meet with the Mayor of Las Vegas on Oct. 3, 2017, but the mass shooting tragedy on the Strip put that meeting on hold and it was never rescheduled. 13 Action News is working with the city of Las Vegas to make sure Kipperman gets his handshake with Mayor Carolyn Goodman.